Toyota has announced two new trims, Active and Sport, which have joined the Yaris hybrid line-up and are available to order now. Active becomes the new entry point to the range and comes equipped with dual-zone climate control, daytime running lights, six speakers, trip computer, electric front windows and split-folding rear seats as standard. The Yaris hybrid Sport sits above Icon trim in the range and features a wealth of kit for the £16,640 p11d price. As the name suggests sporty features like rear privacy glass, rear spoiler and 16-inch alloy wheels are included as standard, plus kit like DAB Radio, Bluetooth, a rear view camera and Toyota’s Touch 2 multimedia system. Crucially for company car drivers is the Yaris hybrid's ultra-low CO2 emissions and high fuel economy, which will help to keep monthly tax bills low and trips to the forecourts to a minimum. The Active model boasts CO2 emissions of just 75g/km, which means a nine percent BIK tax band for the current 2015/16 tax year, and with a p11d price of £15,240 it’ll currently cost a 20 percent tax payer just £23 a month. 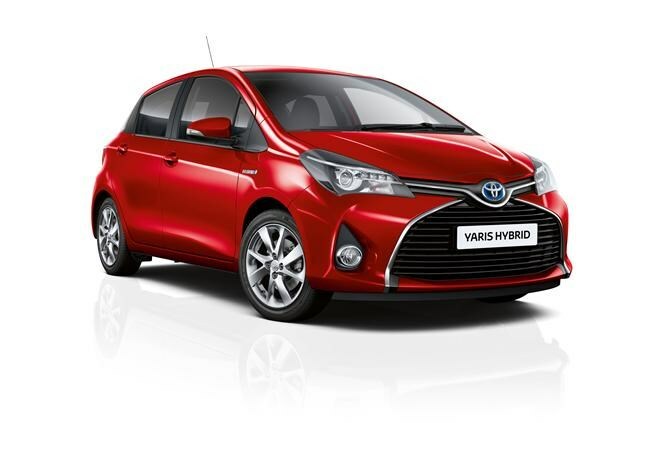 Its low emissions also mean the Yaris Hybrid is exempt from the London Congestion Zone charge and a combined fuel economy figure of 85.6mpg should keep your fuel bills to a minimum if you pay for your personal mileage. Because of the Sport model's larger wheels, CO2 emissions rise to 82g/km, which means the hybrid Sport slots into a 13 percent BIK tax band for the current tax year and will cost a 20 percent payer £36 a month, which is still very low. The official combined fuel economy figure is 78.5mpg. Under the bonnet of the Yaris hybrid is a 1.5-litre petrol engine coupled with an electric motor. The car can run on electric power alone for short spells around the town or it assists the petrol engine for maximum acceleration. There’s 98bhp on offer and 111Nm of torque capable of accelerating the Yaris hybrid from 0-62mph in 11.4 seconds. Click here to read our full review of the Toyota Yaris.